The Hawaiki Submarine Cable landed at Mangawhai Heads on 13 February 2018. Please note that the beach around the landing site will remain closed for another 1-2 days while work continues. A pedestrian diversion is in place, which will take you briefly off the beach around the work area and back onto the beach. · The landing is dependent on operational, weather and marine conditions. · The cable ship will reach Mangawhai Heads and (typically starting at first light) the cable will be brought to the landing site over several hours. 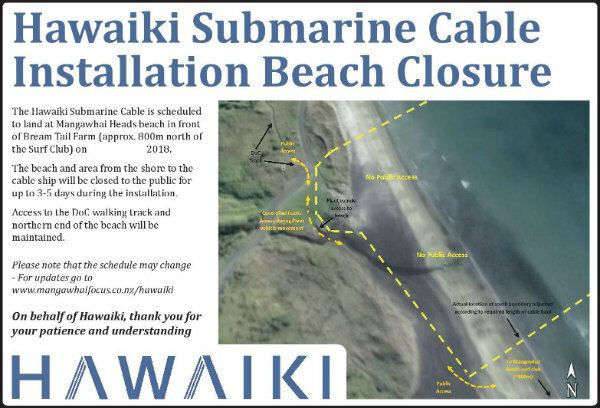 · The area around where the cable is laid on the beach and a several hundred metre wide corridor between the shoreline and cable ship about 1km offshore will be closed to public access for 3-5 days for health and safety reasons. · During this time, small boats and divers will be working between the shoreline and cable ship, and local boaties and marine users will need to temporarily detour around the area. · Any beach users or people walking on the Bream Head Trail, will need to take a small detour around the area of work. New Zealand's internet capacity is one step closer to more than doubling with the landing of the Hawaiki Submarine Cable at Mangawhai Heads later this month. Two cable ships are currently installing fibre-optic cable on the $500m, 15,000km submarine cable system; one in each hemisphere. What does it mean for Northland and NZ? What is the Hawaiki Submarine Cable?